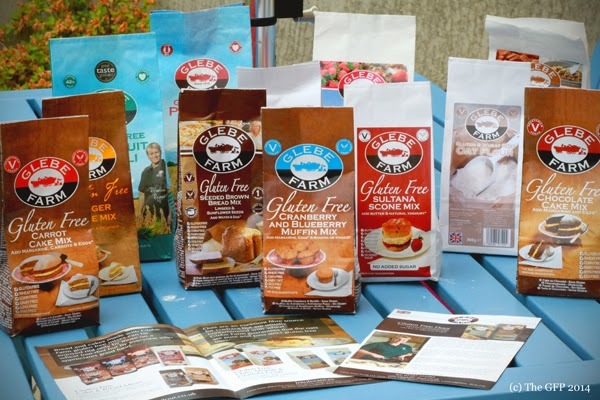 Back sometime in the middle of May, I received an email from someone over at Glebe Farm Foods http://www.glebe-flour.co.uk/gluten_free/home.php inviting me to taste test their range of food. I've only ever seen Glebe Farm Foods in passing at the odd health food store, however I have never tried anything by them before so I was happy to be introduced to something new. So the fine people over at Glebe Farm Foods sent me a staggeringly generous selection of their products. ** I will not be publishing a review of the ciders, as I intend to hopefully, one day have a gluten free cider blog published, which will then include these ciders. I am making no guarantees as to when I will get around to doing this!! How indescribably amazing is all that! I didn't know where to start. I was originally going to blog separately about each product, then I had a rethink and decided that it was probably best to keep the reviews in one place. So ready yourself for a lengthy post! You would expect lots of pictures of delicious muffins and cakes, but alas, my clearly deprived and famished family were too quick for my camera to get decent shots of the different mixes I baked with. Unfortunately porridge does not photograph well - so I didn't even attempt to take any photos. So I began with the granola's. I'm a sucker for granola. It is one of my favourite things to have for breakfast (well, maybe apart from pancakes!) - it's always a treat to tuck into granola. You'd expect to see tasteful shots of the granola about now, but I'm going to admit - the granola's were the first to go out of the lot. No camera work - I was too busy eating. I would personally love to see bigger bags of the granola - they weigh in at 370g, but to a granola fiend like me - I can horse that lot into me in two days! The granola did not go soggy in milk. It was filling and the taste was good. The packaging clearly marked that it was tested to be gluten and wheat free and that they use wholegrain oats. I am thankfully in a position where oats do not bother me. I can eat them all the time. So I'm grateful that they are not off the menu for me. My only issue was with the Strawberry Oat Granola, there were raisins in it. I wasn't expecting that and they weren't listed on the front as an ingredient - so slightly disappointed. If you like granola - I'd say Glebe Farm granola's are for you. Not too sweet. My favourite was the Maple & Pecan one. So good. Next up are the Thanks For Franks bars - I'm going to be honest with you on this one, I am not a fan. Mostly because I do not like raisins in snack bars. The granola bars were filling, but I wasn't that keen on the taste. They are clearly marked with the cross grain symbol on the packaging and looked very inviting to eat. If you like lots of fruit in your granola bars, these are for you. I gave them out to my friends who definitely enjoyed them. Straightforward and satisfying were the words given to me to describe them. So moving onto the gluten free porridge, the gluten free oat bran porridge and the gluten free oat fruit muesli. Overall, these three porridgy (not a word, I know!) type cereals were a hit for me. Even the fruit muesli, though I had this one in small doses, due to the fruit content. Somehow I can take fruit better served in a hot breakfast - go figure! The packaging clearly marks that these products are gluten free, high in fibre and made with sustainable wholegrain oats. Porridge is a great way to set yourself up for the day and it was pretty filling. The taste factor gets a thumbs up from me. So on to the mixes - the packaging on all the mixes clearly marked them as gluten free. There were very straightforward instructions detailing how to bake everything. There were egg free suggestions that directed me to their website and there was a list on the front of each mix declaring what the mix is free from. For example, the cranberry and blueberry muffin mix lists itself as: gluten free, wheat free, corn free, dairy free, soya free and egg free. However, I used buttermilk or milk, eggs and butter (as required), when I baked with the mixes - so really, it all depends what your dietary requirements are and then bake as necessary. The mixes were great. The scones came out beautifully, the cakes, everything. No complaints. If you want something easy and convenient - these mixes pretty much tick all the boxes. So go forth and bake! Everything reviewed for this blog post was clearly marked as vegan/vegetarian and gluten free.